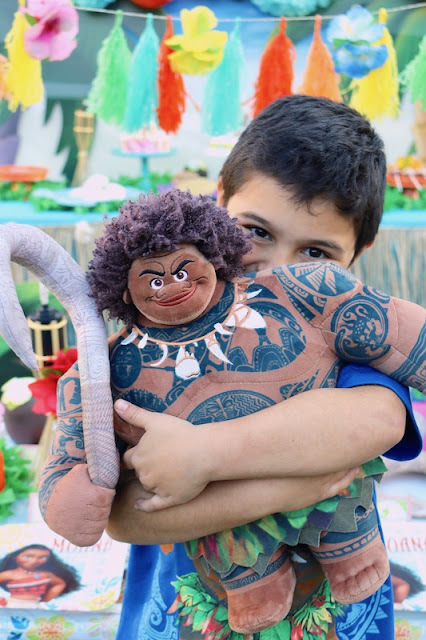 Have you had the pleasure of seeing Moana on the big screen? It's one of our favorite movies! And now with Moana being released on Netflix, our days of watching Moana have increased once again - and I don't mind at all! The soundtrack has been playing in our house and car for months, and its nothing short of amazing! My family and I are huge Disney fans, and we couldn't wait to celebrate and share our Moana party ideas! The movie has beautiful bright colors, gorgeous ocean scenes, lush foliage, and precious treasures that Moana's village has to offer. 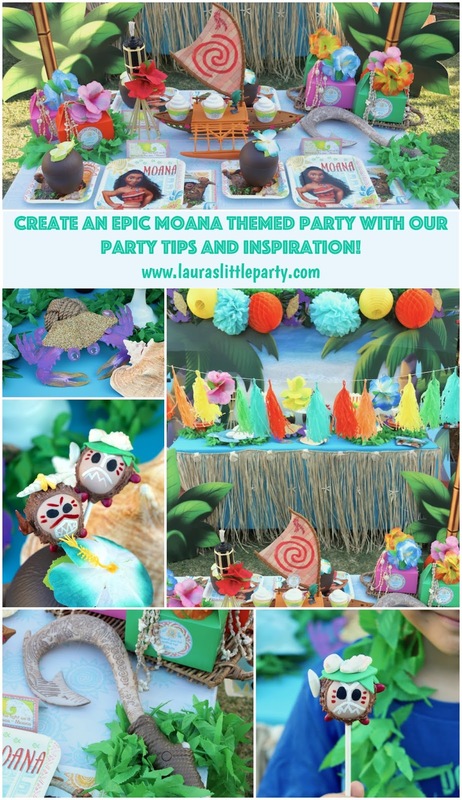 I wanted to capture the look by adding some of those elements within our Moana Party. 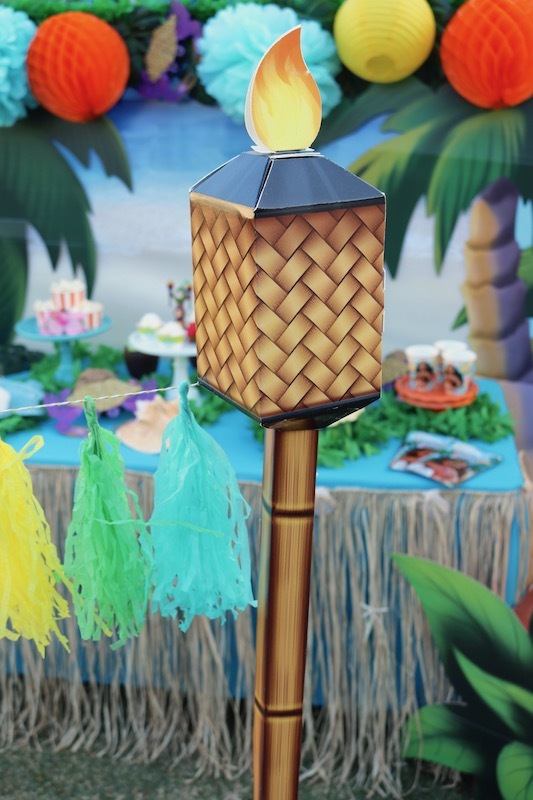 The table was surrounded by Vintage Luau Tiki Torch props. 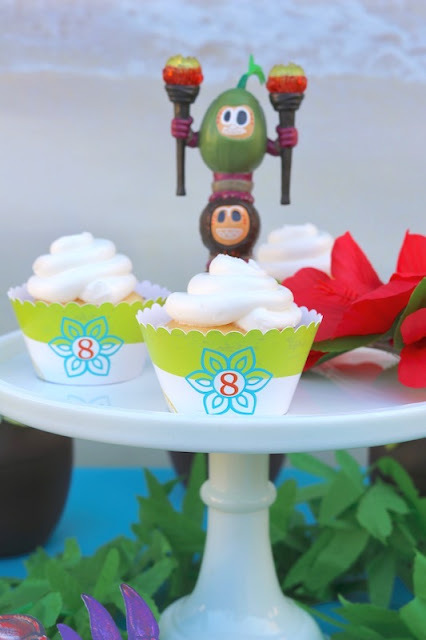 They were so vivid and helped bring the green foliage elements to life. 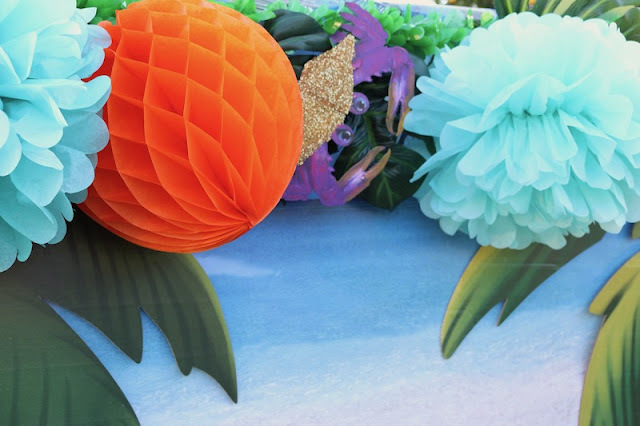 The party backdrop was created with blue horizon flat paper. I attached it to an adjustable fabric frame, using clamps. 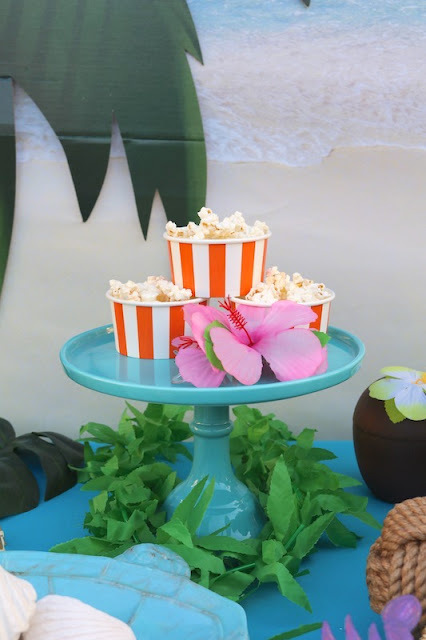 I then added some vintage luau palm trees. To finish it off, I hung green vinyl festooning across the top. I then attached tropical leaves, tissue poms, orange tissue balls, and tissue crabs that resembled Tamatoa! Speaking of Tamatoa, I couldn't resist recreating him! He was one of my favorite characters in the movie, and I just love his zest for all things shiny! 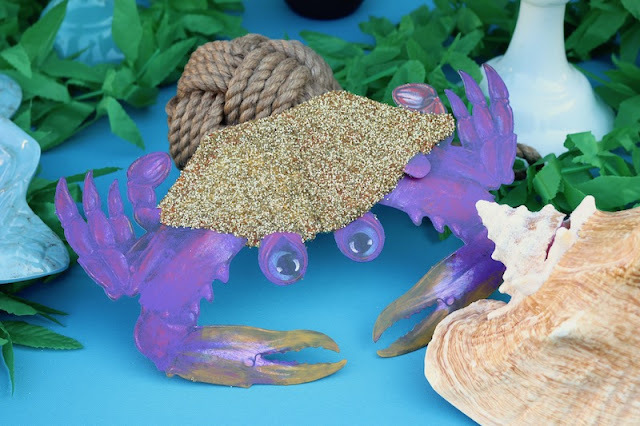 I painted a tissue crab with purple and gold paint, and added gold glitter to his shell. 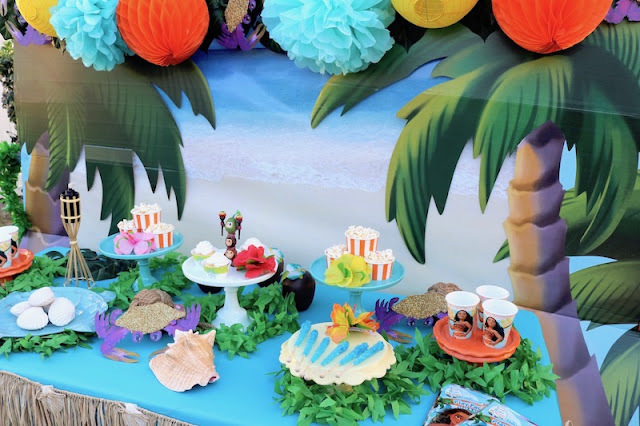 For the dessert table, I used a Bermuda blue tablecloth and wrapped the table with a raffia and seashell table skirt. I added tiki lights and tropical fern leis around all the dessert stands. 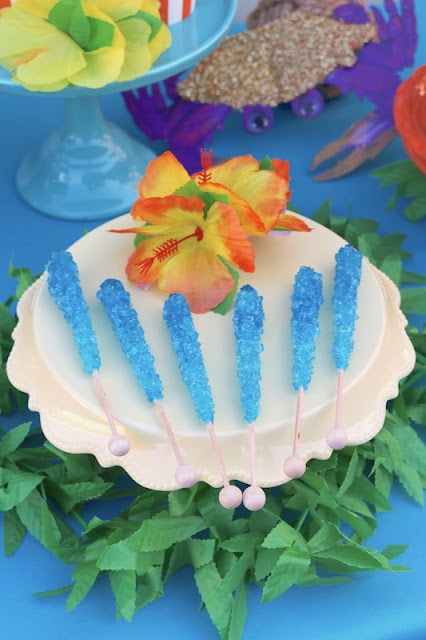 Rock candy was set out for guests to grab. 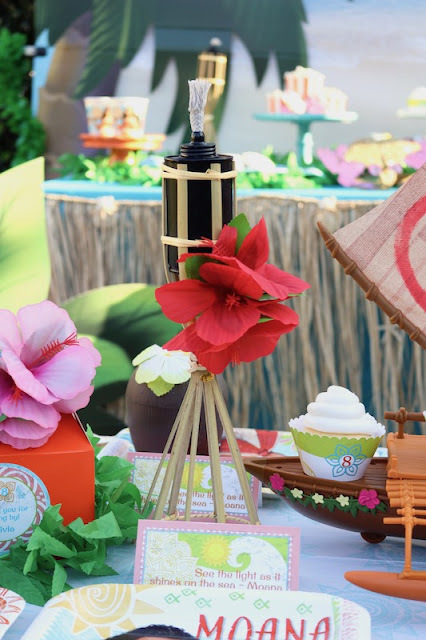 I also added some pretty hibiscus flower clips to all the desserts stands, just like Moana's people wore. 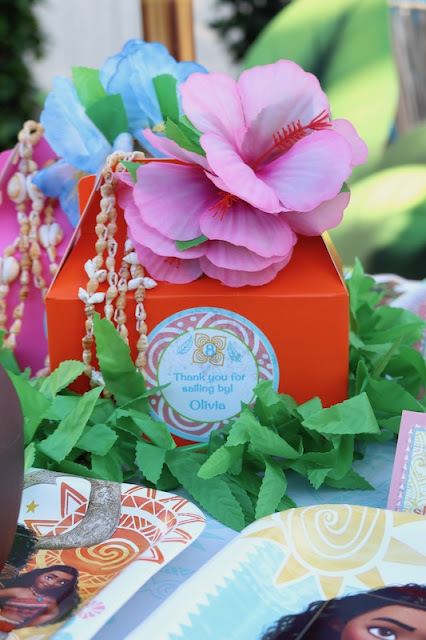 The Hawaiian Princess cupcake wrappers coordinated perfectly with our Moana Party. 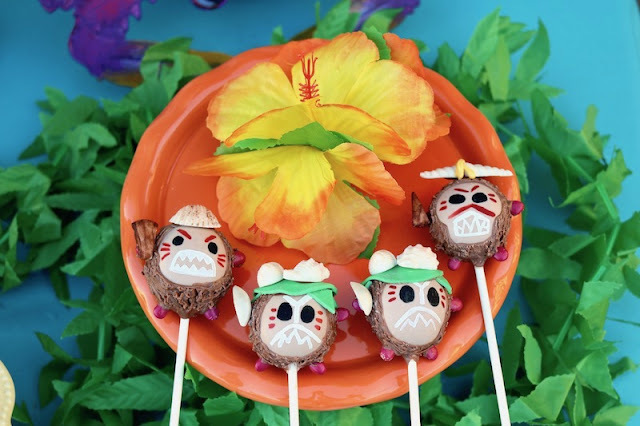 Bella's Bakery created some amazing treats for our Moana party! These Oreo cookie cups were adorned perfectly with Maui's hook, hibiscus flowers, and even the symbol that you see on Moana's sail. And just look at how amazing her Kakamora cake pops turned out! 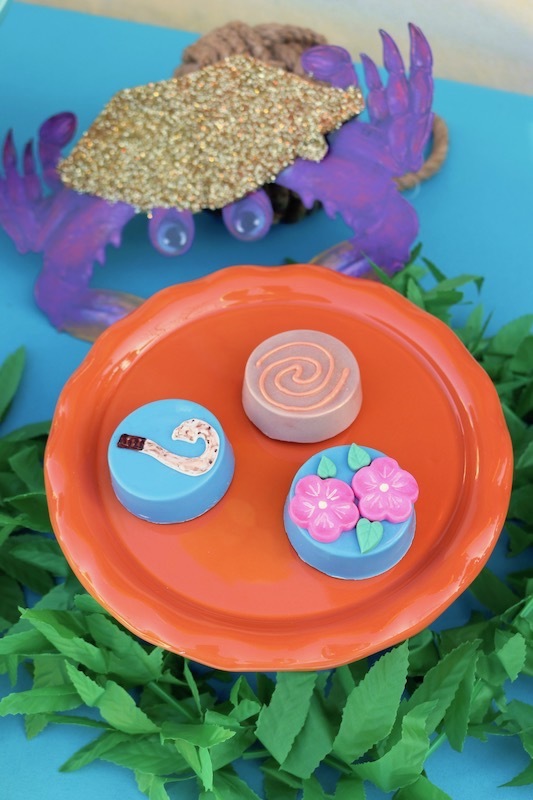 Don't let these cute little guys fool you. They're small but mighty! 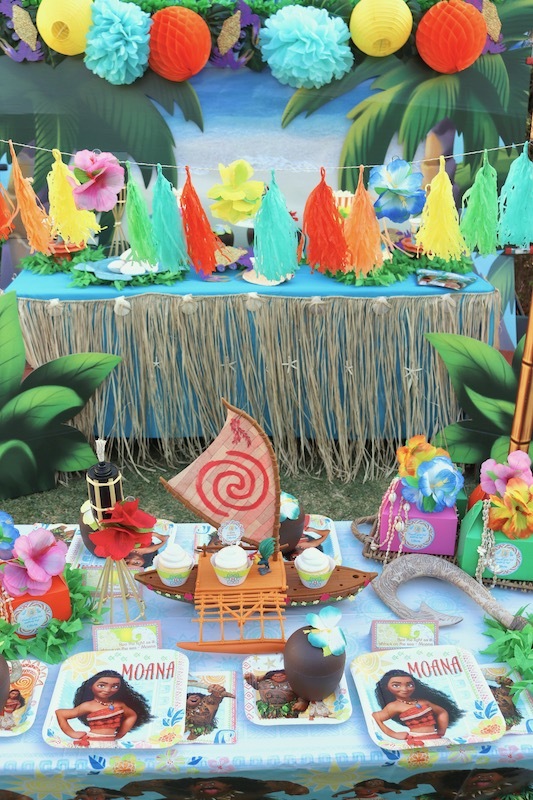 I love setting up a special table for our party guests. 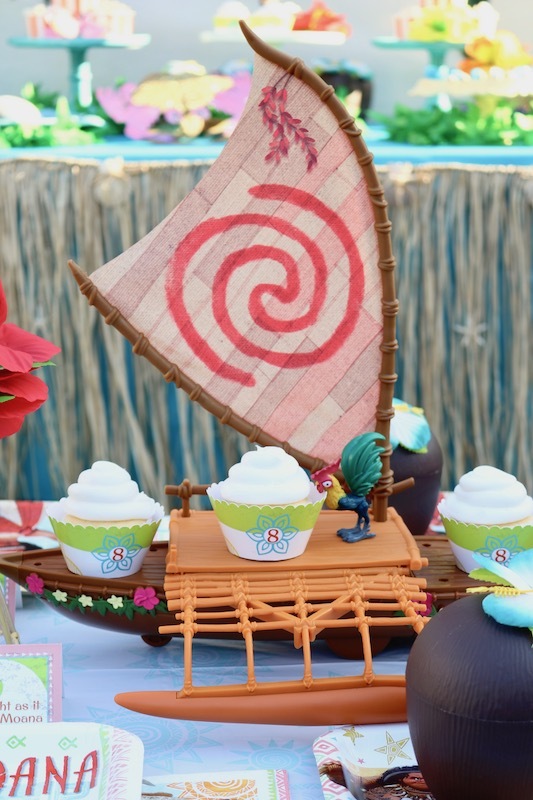 I used the Moana table cover, Moana dinner plates, Moana dessert plates, and the Moana napkins. 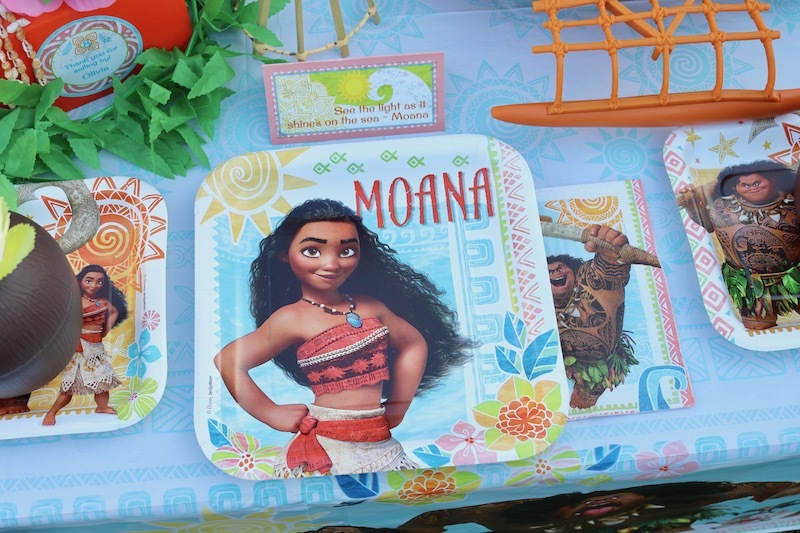 I added personalized favor bag toppers on the table that displayed a line from one of Moana's songs. 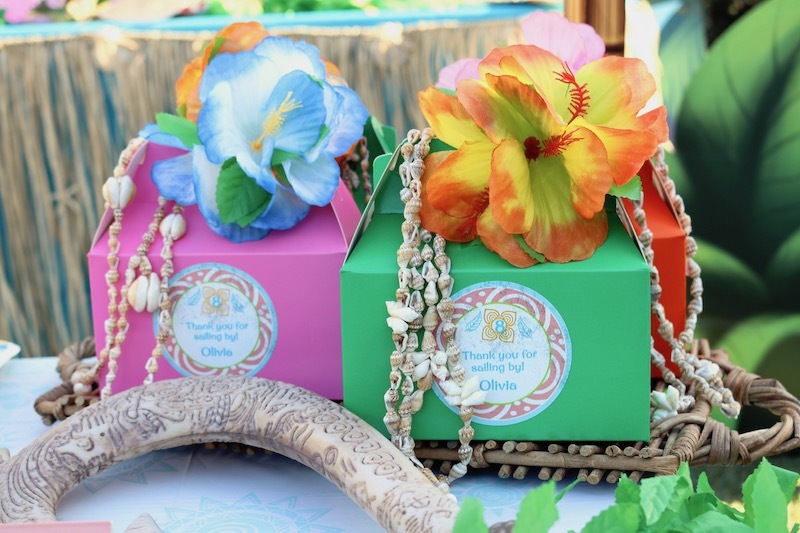 Colored gable boxes were decorated with shell necklaces, hibiscus flowers, and Hawaiian Princess personalized stickers. I also added a few of our Moana themed toys to the party table. Her canoe worked great as a centerpiece that held a few cupcakes. 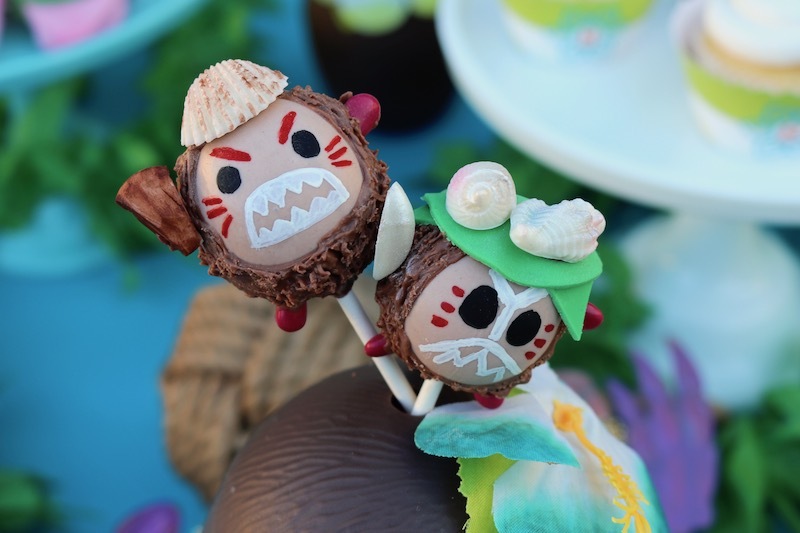 And Maui's hook was a hit! 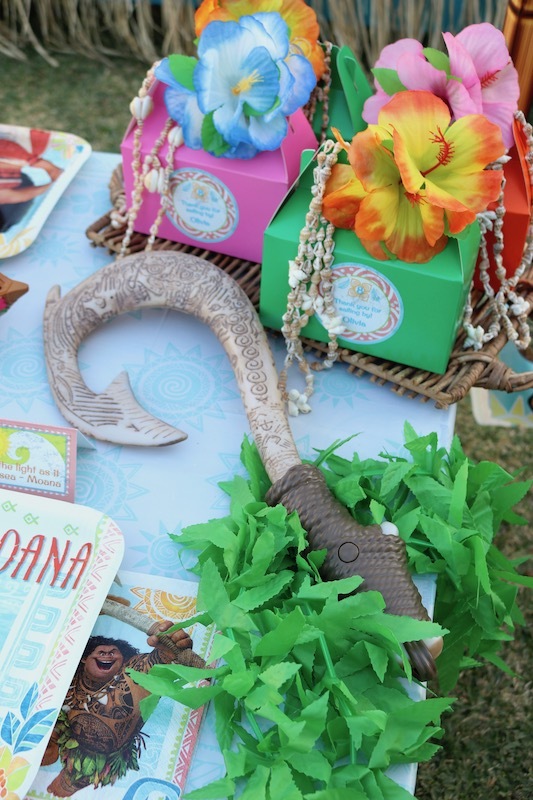 Our Moana party was so much fun to create! We had the soundtrack playing in the background and all the guests had a great time dancing, eating, and playing. 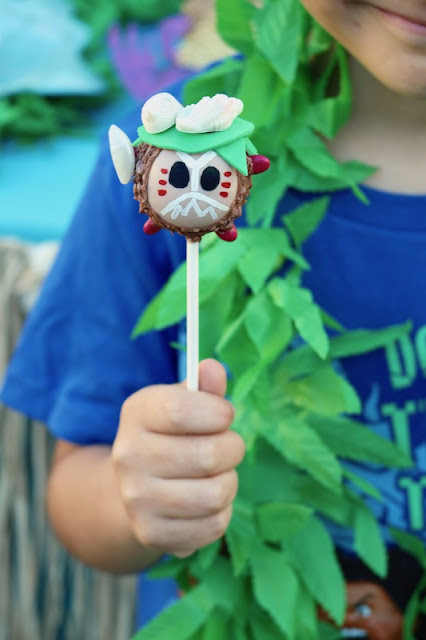 Here's a pin for when you plan your Moana themed party! Hi, Nancy! Thank you so much! 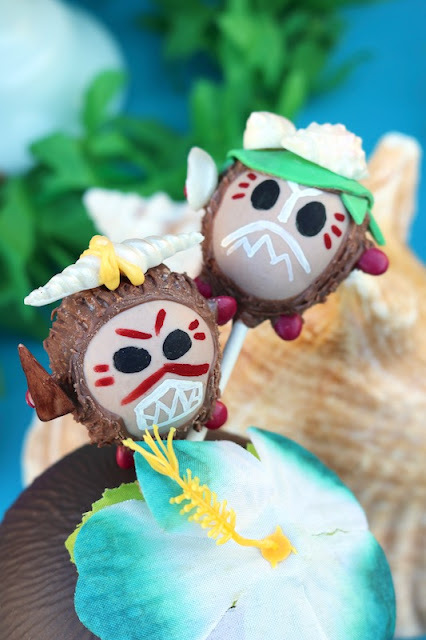 Have you seen the Moana movie? It's one of our favorites. 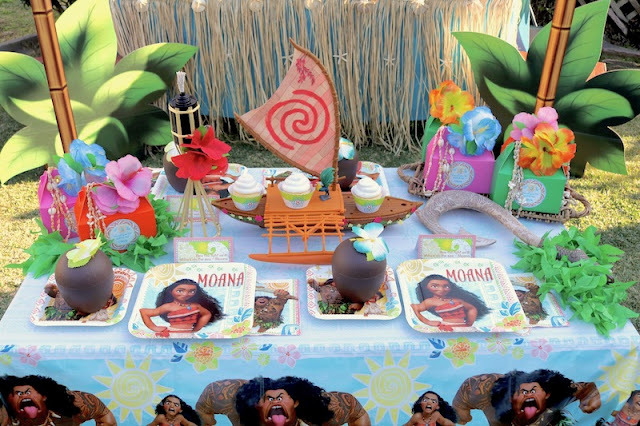 This looks like an EPIC Moana party!!! I love all the little details! Thank you so much, Mindy! So happy you stopped by! We love Moana, and had a great time celebrating!